My daughter loves her Caroline American Girl doll and when she had the chance to add a friend she just about flipped! Caroline's new friend is Saige and she is the 2013 girl of the year and she's absolutely stunning. Saige is a little girl who loves horses and art and that is something my daughter connected to, she loves to be artistic and loves drawing she loves the fact her doll has the same like she does. Saige is a very pretty doll the sculpt of her face is beautiful and her little freckles are adorable. Her hair is a very pretty shade of auburn and her eyes.....wow! I wish my eyes were this vibrant! Her eyes are a very stunning shade of turquoise that resemble the color of the ocean in the tropics. Her tiered skirt is a pretty indigo color and it has southwest inspired beading on it that is bright and it pops against the dress giving it a nice contrast. Saige comes with leather like riding boots that are knee high and have an interesting wrap design on them and they really work with her dress. Her ears are pierced (another thing my daughter loves about Saige) and since she's an arty kinda gal she has a little artsy type of turquoise ring that really compliments her eyes. Unlike any other doll I have ever seen before Saige comes with a beautiful ring as well. A little “turquoise” ring. The ring fits nicely on her first finger, just be careful if the doll is bumped the ring may fall off. If you are traveling with the doll, I would suggest leaving the ring at home just in case you would not want this to get lost. If you'd like to send Saige on adventures no worries she has got some really neat accessories that you can add including her horse Picasso, a hot air balloon (wish I grew up in her family), a border collie named Rembrandt (noticing her love of the arts yet?) and if that isn't enough you can purchase her art set including an easel, paint brushes and palette, paint tubes and 5 paintings on real canvas. The level of detail in these dolls is simply amazing. I'm blown away and wishing I was 8 years old again. And one other thing I love about the American Girl dolls is the ease of how the dolls come out of the box. Christmas was a little over a week ago and my daughter received several toys from Santa and almost all of them took several minutes to get out of the package. It's ridiculous how long it took us to get things unboxed. American Girl dolls can be unboxed by anyone, they're so easy to get out of their boxes that all toy manufactures should take a page out of their books. Very well done plain and simple. American Girl Doll of the Year 2013 Saige is available NOW in stores and online. She has so many wonderful accessories and great items that just would be so much fun to play with. Your little girl with just adore Saige, she is a modern girl that your little one will be able to relate with and will love. The American Girl Doll of the year is only available for one year, so make sure to pick up Saige soon. Saige comes with a book called Saige, and there is another book in the series that will be available in January, Saige Paints the Sky. Celebrate the release of Saige the 2013 Girl of The Year by attending one of the fun in-store events scheduled to take place January 1-4! Attendees can participate in fun FREE 2013 Girl of the Year themed activities and crafts and there will be fun giveaways too. Visit www.americangirl.com/stores to find a store near you! 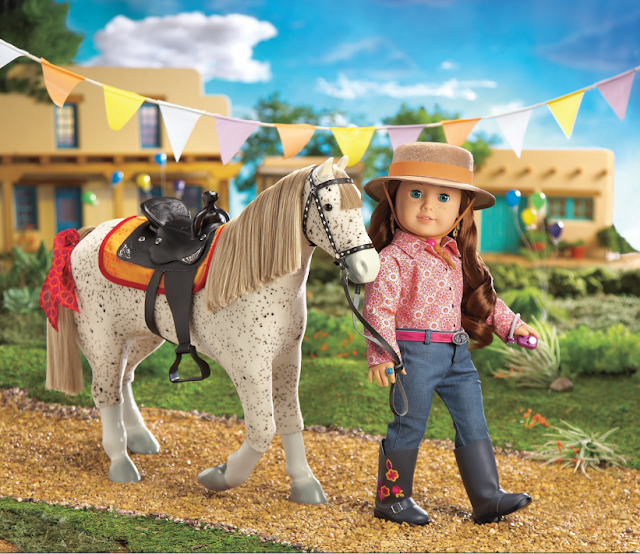 Currently there is a great contest on the American Girl website, you can Soar with Saige. To enter you design a hot air balloon! Enter by April 1 and you'll be entered for a chance to win one of 10 prize packages worth more than $260, including a Saige 18" doll and her hot air balloon! American Girl will upload each piece of artwork and incorporate them into a series of colorful online hot air balloon mosaics—so please don't glue or affix anything to your design! After June 3, be sure to come back to Saige's special site again and again to see your artwork, view the mosaics, play a game, and send e-cards, plus find out our 10 lucky winners. Susan S. Disclosure: The reviews and or opinions on this blog are my own opinions . I received a doll to review. No monitory compensation was received. I was not required to write a positive review. Your experience may differ. The opinions I have expressed are my own I am disclosing this in accordance with the Federal Trade Commissions 16 CFR Part 255: Guides Concerning the Use of Endorsement and Testimonials in Advertising . Oh she is just gorgeous! I love Saige, this would be great for my daughter, I would love to get this for her birthday! Look at the eyes, they look just like my daughters eyes. She has an Amaeican girl and would love this little darling. Your daughters picure is so nice! I love that this doll has a horse, I always wanted a horse as a child. She is so pretty. That is amazing how realistic this doll is! Her dress is beautiful and her boots are so stylish! Saige is really pretty. I bet my daughter would love her! The American doll is becoming quite popular these days. Lovely! Always wanted one when I was little and can't wait to get one for my daughter! What a pretty doll!Your daughter looks so cute too! this is an amazing doll, it would be hard to not fall in luv!!! Even her boots are so adorable! this is one of the best!!! This doll is downright gorgeous, and the ring adds a wonderful little touch. It reminds me of a little girl playing with mommy's jewelry. How pretty, I love her outfit. So bright and so much detail. These American Girl dolls are so neat. I wish they were available when my daughter was young.